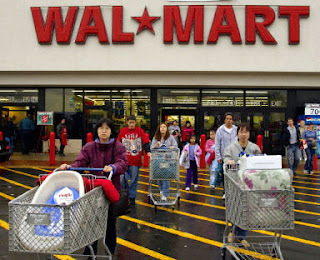 Doesn't it seem like a good gage of how the economy is doing when Walmart is doing better than most retailers? Really, how can you resist when you know that you can get something at Walmart for so much less? I know I save money when I go grocery shopping there, compared to my regular grocery store. I heard an interview today that said even Target was not doing as good as Walmart. I think that says a lot right there. I mean most people think of Target as getting some pretty good deals. Now I would not say that I love Walmart, but if I can save some money, than I guess that's where I am going shopping!